Photo: "Your Father in Heaven knows your name"
In the visiting teaching message, Jeffrey R. Holland was quoted as saying, "Your Father in Heaven knows your name." That is what is worthy of a 1000th post! Though Shakespeare has a valid point in his statement that "A rose by any other name would smell as sweet," the fact remains that names are important. We are terribly embarrassed when we forget a friend's name. When we want to praise a customer service representative, we use his name. When a mom wishes to make a point, she uses the full name of the child in question. Nothing sounds better than to hear a loved one call you by name. Knowing that Heavenly Father knows my name means not feeling alone, lonely, or insignificant. It means feeling loved, valued, and important. It means finding strength through trials, solace in sadness, and joy in sunshiny days. Everyone is someone specific. Though I am not the only Kristi, I am still unique. Heavenly Father knows my name, and knows who I am--and He knows you, too. I guess that hitting the 1000th post milestone has caused me to reflect a bit on what I am doing with this blog. Am I a positive force for good? Am I truly Thankful Me? 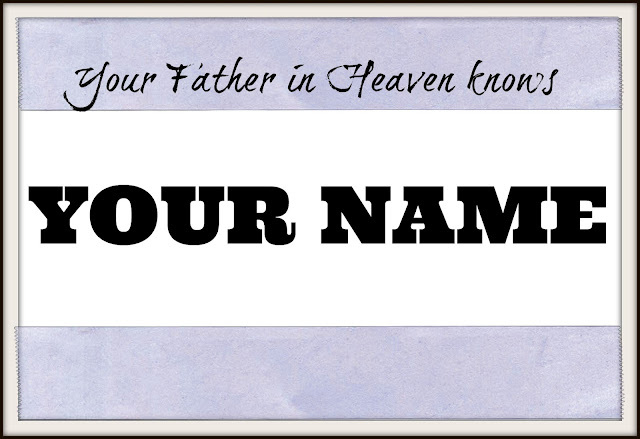 Do others read my posts and realize that Heavenly Father knows their names, too? I hope so. Thanks for Heavenly Father, and thanks for you! Whether this is the 1st post of mine you have read, or the 1000th, thank you for stopping by! This was an excellent topic for this occasion. I don't know if I could have blogged when my kiddos were little. I certainly understand needing to take a break for a while. Congratulations on your 1000 post of positivity. Because that's what your blog is to me; a positive haven for me to go, remind me of the good in the world and the positive people in it. Thank you for that. You are a very good influence on all of us! Congratulations on number 1000! I am thankful for you.